How would you describe yourself? Are you someone with broad knowledge or narrow focus? Do you draw on a wide variety of experiences with no centralizing concept to pull everything together? Or do you organize everything that happens in your life and all the knowledge you have acquired around one big idea? The fox uses all of his cunning devices, the hedgehog has but one: he rolls up into a ball. Despite all of the fox’s cunning, he never succeeds against the hedgehog’s simple, yet masterful defense. 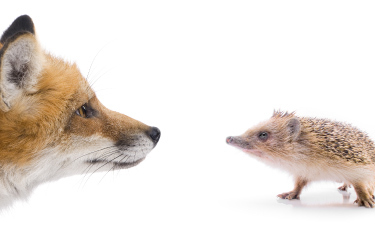 While it can be successfully argued that people are far too complex to group them into foxes or hedgehogs, the concept is useful to us as Christians. For example, most people find the world is too perplexing to relate everything to one big idea—much like the fox. On the other hand, to the Christian, all things work together as part of a single grand design—much like the hedgehog. As Christians, we follow the example of Jesus Christ. Figuratively speaking, Jesus Christ is a type of hedgehog while Satan is a type of fox. Let me explain. These two divergent ways of thinking are contrasted in the epic battle Christ had with Satan, which is recorded in Matthew 4. In this exchange, two masterminds clash. One is a criminal mastermind, pulling out all the stops to crush our Saviour; and the other, a loving mastermind, determined to rescue mankind. In this conflict, we get an extraordinary view into these two great minds. 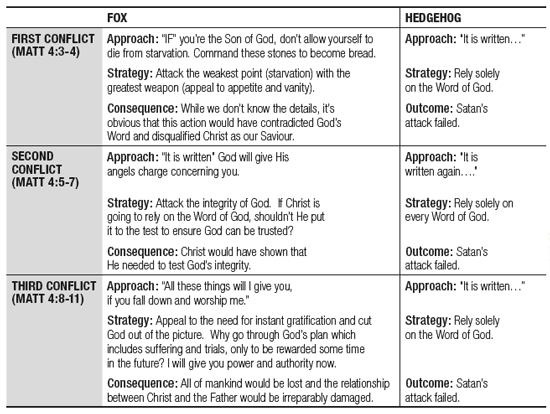 The conflict is preceded with Christ fasting 40 days and nights in order to bring His centralizing “hedgehog” concept into sharper focus. As a result of this spiritual effort, He was starving physically; and then the fox approached. With each conflict, Satan’s craftiness intensifies. He attacks Christ’s point of weakness, and then he attacks Christ’s point of strength. Finally, he attacks Christ’s hope of the Kingdom. Like the hedgehog that has only one defense, Christ had one defense and repeatedly utilized it. He relied on the Word of God! When Christ overcame Satan, Satan fled from Him (Matthew 8:11). Like Christ, we must have one defense and rely on it every time we see Satan approaching (James 4:7). We have a choice to make. We can be like the hedgehog or we can be like a fox. We can be enlightened or live in darkness. In the light, everything is connected and organized around a single, big idea: enternal life as a son of God. In the darkness, everything appears disconnected and very confusing at times. We must not be ignorant of the fox’s cunning devices (2 Corinthians 2:11). Clearly, we must solely rely on the Word of God. Just as the fox cannot defeat the hedgehog’s singularly simple, yet powerful defense, Satan, the criminal mastermind, cannot defeat our singular, but simple and powerful defense. If we draw close to God, we can overcome Satan! (James 4:7). Remember, Christ’s example and His promise in Revelation 3:21 if we overcome as He did.